Fresh from any Christmas shenanigans, the Perth Scorchers welcomed the Melbourne Stars over to the WACA on a warm Boxing Day afternoon, where a well-drilled Adam Voges led side took away the bragging rights. The WACA pitch looked good for a night of T20 cricket, and it also proved the incredible resilience of the Scorchers in defending lower T20 totals. Much comment was raised on social media about the absence of Kevin Pietersen for the Stars, back in England for Christmas; that if he were in Perth, it would be a Stars shoe-in. Alas, we would never know. Despite being skilled early and wobbling at 3/10 after Michael Klinger, Will Bosisto and Ashton Turner were dismissed early by James Faulkner and Michael Beer, it was a Hilton Cartwright-Voges partnership of 83 that was the turning point for the Scorchers. Without any pressure, or any crash-and-bash style, Cartwright and Voges expertly worked the ball around to push the Scorchers run rate back over a run a ball by the time Voges edged to Handscomb with the score 4-93. Faulkner by this time had bowled out after a superb opening spell, perhaps his best of recent times, and the Scorchers looked far more comfortable at the wicket. Cartwright fell soon after, but a potential disaster had been averted. Enter Ashton Agar’s late cameo and it lifted Perth to a pretty defendable 6/142. That “defendable” turned into victory after the Stars order was shattered by one AJ Tye (5/23). No hat-trick for a superb T20 performance, but it did rip out the Stars’ key batsmen – including Luke Wright, Marcus Stoinis and Peter Handscomb, with Will Bosisto taking a screamer on the deep square boundary to dismiss Handscomb, after a juggle over the line seeing him land back inside the field of play. It seemed like things were getting out of hand, and with Jhye Richardson smashing Glen Maxwell’s stumps after receiving a vicious return on the shin on hand one ball prior, there was a lot of work to do. Rob Quiney and James Faulkner were given the keys to drag the Stars back into it, but the chase was ultimately left too late. A superb salvo of bowling from the Scorchers (Tye, Agar and Mitchell Johnson all finished with economy rates of six runs per over or lower) was plenty of damage done. Faulkner (35 off 31) and Quiney (25 off 27) had the intent but never quite got there, unable to get bad balls away and finding fielders whenever they found the middle of the bat, and the Stars finished 8/129. The night belonged to Tye through and through. By simply executing good bowling and line and length, the Stars had no real answer. Wright (21) was the only one of the top four to get into double figures. Most disappointing was the intent of the Stars; they came out like they were chasing 243 instead of 143. 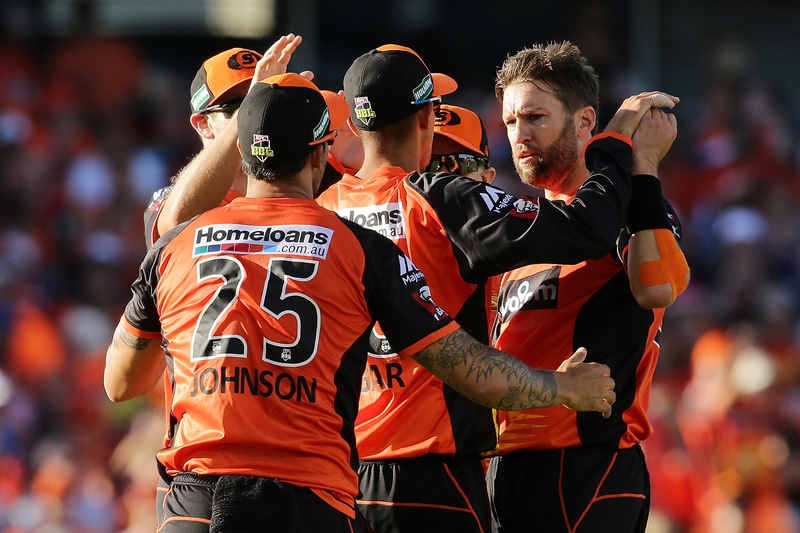 Every ball was destined to be hit out of the park or off the square with some big early swings, and the Scorchers capitalised, restricting the Stars to a game that looked a shadow of the run chase against the Heat. It’s set the Scorchers up for a blistering game against the Stars cross-town rivals, the Melbourne Renegades, on the Friday before New Year’s Eve. Both sides are now two from two heading into the clash, with the ‘Gades in hot form, especially with the willow. The Stars now must wait until January 2nd to again face their first opponents, the Brisbane Heat, before they can look to break their winning duck.